The 6 backpacking mugs we tested. We put 6 of the best backpacking mugs to the test to see which ones held up to the rigors of backcountry life. After nearly a month of testing, the TOAKS Titanium 450ml Double Wall Cup is the one we recommend. Its great insulation, durability, and well-thought-out construction made it our go-to mug. The GSI Outdoors Infinity Backpacker Mug, at only $9.95 retail, was a surprisingly fierce contender, holding its own in both insulation and weight with the much pricier titanium mugs. We highly recommend this mug as a budget option. It’s a great alternative to splurging on titanium. If you’re looking for insulated camping mugs and thermoses, you’ll find our reviews and recommendations in our guide to the best camping mugs. Serious coffee drinkers need look no further. 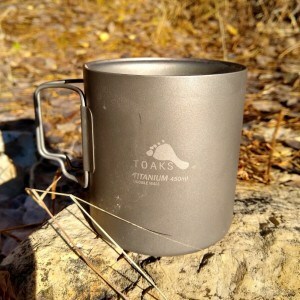 Although at 4.7 oz this was the heaviest mug we tested, the TOAKS Titanium 450ml Double Wall Cup was still our Top Pick. It’s solid, durable, well-made, and a pleasure to drink out of. It’s really everything you need in a backpacking mug. It tied with the Snow Peak Ti-Double 450 Mug as the best performer in our heat retention tests, keeping water hot for 48 minutes without a lid and for 1 hour 56 minutes with a lid. It also had the perfect amount of heat radiating out of the sides to warm our hands on chilly mornings. TOAKS offers a titanium lid for $4.95 that weighs 0.5 oz. Although the lid is designed for heat retention rather than drinking, it’s a nice addition to keep coffee warm between sips. At $44.95, it’s a pricey backpacking mug, but we think the durability and quality design warrant the investment. This quickly became our favorite for sipping coffee in the morning and scarfing down ramen on cold nights. For only $9.99 you get a lot of bang for your buck with the GSI Outdoors Infinity Backpacker Mug. Not only is it our Best Value pick, it was one of our overall favorites, beating out most of the expensive titanium mugs. The mug is made of clear polypropylene (a type of plastic) with a cloth sleeve for insulation. It’s also the only mug we tested that comes with a lid. We initially thought the webbing handle was kind of silly, but we quickly came around to it. It makes it easy to hold the mug when it’s full, and it’s awesome for clipping the mug to your pack. In our heat retention tests, the Infinity Backpacker Mug kept water hot for a whopping 1 hour 47 minutes with the lid on. That’s only 10 minutes behind the double-wall titanium mugs (and you have to buy the lid for those separately). We also consistently felt the least amount of heat radiating out the sides of this mug, though it was still just enough to warm up our hands on cold mornings. The main drawback to this mug is it’s not as durable as the titanium mugs. After only a few weeks of use the rim started to show some scratches and signs of wear. The cloth sleeve also collects grime and is hard to clean. But ultimately those are pretty minor complaints. For $10 you get a mug almost a full ounce lighter than the two double-wall titanium mugs we tested that insulates nearly as well. We’re impressed. Single-wall mugs don’t insulate as well as double-wall mugs, but a lot of backpackers prefer them for the versatility of being able to cook in them. They also don’t weigh as much. At only 2.4 oz, the Snow Peak Ti-Single 450 Mug is impressively light. Without a lid, this mug kept water hot for 42 minutes. To compare, the Snow Peak Ti-Double 450 Mug kept water hot for 48 minutes. It definitely didn’t provide a nearly as enjoyable coffee drinking experience as the more insulated backpacking mugs, though. When filled with boiling water, it was way too hot to hold without the handles and prone to burning lips. In chilly weather, the Ti-Single 450 Mug cooled off too fast for us to actually enjoy sipping our hot beverages. But that’s the nature of single-wall mugs. We didn’t have the issues with the handles or the easily scratched coating which we describe below for the Snow Peak Ti-Double 450 Mug. The handles were easy to flip in and out. They stayed firmly in the position where you put them, which is exactly what we wanted. For backpackers looking for a minimalist, ultralight single-wall mug, the Snow Peak Ti-Single 450 Mug is our top choice. Snow Peak gets a lot of rave reviews in the backpacking community, so we were excited to test the Snow Peak Ti-Double 450 Mug. After doing so, we think this is a good double-wall mug with a few minor issues. First, the good: It’s 0.5 oz lighter than the TOAKS double-wall mug (though at a cost of $5 more, for a whopping $49.95 MSRP). Its performance in all of our tests was almost identical to the TOAKS double-wall mug. It kept water hot for 48 minutes without a lid and for 1 hour 57 minutes with one. We like that Snow Peak offers a coffee mug style lid, which you can actually drink from. However, at $5.95 and 1.1 oz — and with pretty consistent negative reviews — we’re not sure it’s worth it. And now the bad: Our biggest gripe was that the handles don’t seem to be attached tightly enough. They flop and flap around quite a bit. It got irritating when the handles constantly banged against the side of the cup. Sometimes they crossed over each other and got stuck. Also the Ti-Double 450 Mug’s coating scratches off easily. The mug started to show wear significantly sooner than the other titanium mugs we tested. Neither of these issues affect the mug’s functionality, but for a $50 mug we’re a little disappointed. Still, the mug itself is well-made and solid, insulates very well, and is 0.5 oz lighter than the TOAKS double-wall cup. It’s not a bad mug by any means. If you’re counting every ounce, then weight alone might tip the scales toward this one for you. We just didn’t think it quite lived up to all the hype. Even though the TOAKS Titanium 450ml Cup didn’t win any of our awards, it’s a solid single-wall mug and a great buy at $24.95 retail. It’s well-designed and the uncoated titanium looks super sleek. We also like that TOAKS included measuring lines on the side of the cup. At the end of the day, though, we preferred the Snow Peak Ti-Single 450 Mug to this one because it performed slightly better in our heat tests and is slightly lighter. Is that slight difference enough to justify the additional $5 on the price tag? That’s up to you. We liked this mug a lot and would be happy to add it to our lightweight backpacking kit. The Sea to Summit X-Mug was the most packable mug we tested and nearly the lightest. It weighs 2.7 oz and collapses down to a flat disc. If packing space is your biggest concern, then it might be the right option for you. The space savings is nice, but since we generally either clip our mugs to the outside of our packs, nestle them into our other cookware, or stuff them full of dry goods (like a zip-lock of instant coffee), they don’t take up too much extra space anyway. The X-Mug is made of silicone which didn’t insulate very well. The mug kept water hot for only 27 minutes without a lid. We also found it awkward to hold and drink out of when full of hot water. If a simple, collapsible mug/bowl is what you’re looking for, this does the trick. As a dedicated coffee mug, we found it lacking. With the other great options out there we don’t see much of a place in our packs for this one. The X-Mug collapses down to a flat disc. 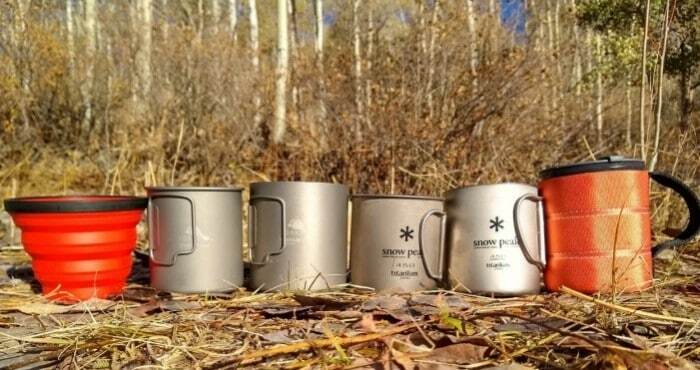 Single Wall: These backpacking mugs are about as simple and versatile as you can get. They sacrifice a lot in performance, though. The single layer of insulation doesn’t do a whole lot to maintain your drink’s temperature. Still, they are the top choice for backpackers prioritizing weight savings and versatility above all else since they can double as cook pots. Double Wall: With two layers of material as insulation, these mugs do one thing, and they do it well: insulate. They’re generally twice as heavy and twice as expensive as single-wall mugs. Placing them on or near a heat source will damage them, so you’ll also have to bring another form of cookware. The extra few ounces are well worth it for backpackers who often camp in cold weather or are just really serious about their morning coffee. 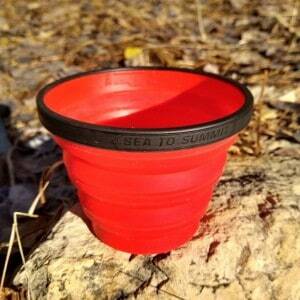 Collapsible: Typically made of silicone, these mugs compress down to a disc that easily slides anywhere in your pack. Weight and space savings are the real benefit to these mugs. They don’t do much for insulation, and don’t hold a candle to a real mug when it comes to usability. Titanium is durable and extremely light, making it perfect for backpackers who count every ounce. It comes with a premium price tag, though. Stainless steel is probably the most common material for backpacking mugs and cookware, especially for backpackers on a budget. Stainless steel can last decades if cared for properly, but can be twice the weight (or more!) compared to the equivalent titanium product. Aluminum is lightweight and supremely affordable. However it’s not very durable and not great at insulating. It also has high heat conductivity which makes it difficult to handle aluminum mugs and cups with hot liquids in them. Plastic is cheap and light and can insulate well. It’s not as durable as metal cups, but for the price it holds its own. For budget-conscious backpackers, high-quality plastic mugs can be a great buy. Silicone is relatively new to the game. It’s light, flexible, and inexpensive, which can make it a good option for some, though it’s not as durable or versatile as metal. It also doesn’t insulate well. Many collapsible backpacking mugs are made of food-grade silicone. Is Titanium Worth the Price? Titanium is a popular material for backpacking mugs and cookware. It’s lightweight and incredibly strong, yet it will cost you a lot. We know plenty of backpackers who have gotten along just fine for years without titanium, so is it really worth the price tag? We’re big fans of investing in gear that’s durable and will last for decades. For mugs, that means either stainless steel or titanium. With steel, you pay for that durability in weight. With titanium, you pay for it in cash. But the weight savings are substantial — titanium is nearly 45% lighter than steel. For backpackers who put a lot of miles on their gear, we do think titanium is a worthwhile investment. It’s certainly not a necessity, but 30 miles past the trailhead you’ll probably be thinking a lot more about those few extra ounces on your back than the $25 you saved. We used a food thermometer to time how long water in each mug took to cool from boiling (204°F at 4000′) to 120°F. Note: TOAKS and Snow Peak sell lids separately for their mugs. We did not have the specific lids from those manufacturers, but used a lid that fit closely, so these tests are an approximation. Since the Sea to Summit X-Mug does not have a compatible lid, we omitted it from the “with lid” test. In this test, we wanted to know how much heat you could feel through the walls of the mug. We filled each mug with boiling water, held it for 30 seconds (if we could!) and ranked them from 1 (almost no heat) to 10 (too hot to hold). We brought these mugs camping in the southwest desert and backpacking in Utah’s Wasatch Mountains to test them out in various conditions and with our backpacking coffee makers. We also used them as much as we could in our daily lives over the course of four weeks.